If Mecca is Islam's high seat of spirituality, then the picturesque town of Anandpur Sahib in Punjab is the religious heartbeat of the Sikh faith. 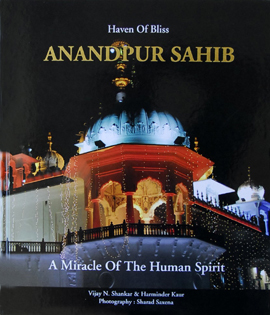 The holy town is the subject of an illustrated volume "Heaven of Bliss, Anandpur Sahib: A Miracle of Human Spirit" published recently. "Pilgrims walk through Anandpur Sahib today with the verses of the gurus on their lips. Their feet touch the dust of great shrines of Kesgarh Sahib, Guru ki Mahal, Bhaura Sahib, Sisganj Sahib, Akal Bunga, Guru ka Lahore, Tirbeni Sahib, Sehra Sahib and several more," says Harminder Kaur, who has co-authored the volume on the legacy and spiritual heritage of Anandpur Sahib, along with Vijay N. Shankar. The images have been contributed by Sharad Saxena. Every night, the Takht Kesgarh Sahib at Anandpur Sahib, the bastion of struggle and witness to the glory of 10th guru of Sikhism, Guru Gobind Singh, dazzles with the light of faith. It looms like an edifice set in the backdrop of undulating hills on the horizon - occupying the almost the entire sprawl of Anandpur Sahib, the holy town founded by Guru Tegh Bahadur in 1665 and developed by Guru Gobind Singh. The town is living archive of history with numerous shrines and monuments - painted a shade of dazzling white - which speak of a moment of drama in history 311 years ago when the Khalsa faith was born in the town in 1699 on the day of Baisakhi. Guru Gobind Singh baptised the Sikh warriors of faith at the site of the Takht Kesgarh Sahib - one of the biggest Sikh shrines in the town. Anandpur Sahib comes to life every year during Holi, the Indian festival of colours when millions of devotees from across the world throng the town for a show of martial arts and revelry to celebrate Holla Mohalla, the Sikh name for Holi. The tradition dates back to Guru Gobind Singh. The volume, a richly laid out anthology of colourful photographs, historical paintings and texts, captures the spiritual lifeline of the mecca of the Sikhs, the battles fought by the Sikh seers, their trials, victories and the festival of Holla Mohalla. White and blue are the dominant shades of the town's colour palette. The white shrines stand out in contrast to the bright blue, "another colour which one sees in abundance at Anandpur Sahib". "This is the colour of the Nihang's or the gurus warriors and the Akalis. Just as the khalsa signifies the khalis or the pure, sharp deep blue is the colour of the cosmos. It is also the colour of the sky and of the sea," writer Kaur says. "It is difficult to understand how Guru Govind Singh held in himself so many great and wonderful gifts. For not only did he fight furious battles with his double-edged swords against oppression and injustice, but he was an acomplished poet and creative literary genius in many languages. He was a spiritual guru of a large and ever growing community and he was a sensitive and emotional man," Kaur says. The volume is also a fascinating travelogue with historical anecdotes and first person's account. A small capsule, "The Guru's Foregiveness", narrates the tale of 40 soldiers who had deserted Guru Govind Singh at Anandpur Sahib. The deserters were inspired to fight at the battle of Khindrana by 'Mai Bhago', a brave Sikh woman of Jat origin who fought the Mughal army of Emperor Aurangzeb at Khindrana, and survived the war. She exhorted the deserters to apologise to the guru and redeem themselves. The deserters inflicted damage on the Mughal army at the war, but were fatally wounded. While 39 deserters died fighting, one died in the arms of Guru Govind Singh. The guru forgave them and till today they are remembered as the 40 liberated souls or "mukse". The town still retains the spirit of its martial past. "Every evening, after the prayers or 'ardas' are said, the war drums created by Guru Gobind Singh, the Ranjit Nagara, are sounded. It is a huge drum and rumbles in a crescendo," Kaur said. The Anandgarh fort is the town's historical landmark. Built in the 17th century, Guru Gobind Singh lived in the fort for 16 years. Harvatar Singh Sodhi, a 93-year-old resident of Anandpur Sahib, traces his lineage to the time of the gurus. He has performed "kar seva" at the fort "with own hands", Kaur says. "He learnt from generations that old buildings in the guru's time were built with a mixture of lime, jaggery and jute yarn. Cement was not invented then," the writer said. Sodhi was part of the team that restored the fort in the 1970s. The anthology has been published by Corporate Vision in collaboration with Lahore Books.